Set in a world of swords and magic inspired by Norse mythology, the God-like heroes Frey and Freya must destroy massive monsters that roam the earth with swords and other weapons in order to complete missions and collect crystals. Using the crystals collected during a mission, you can upgrade or create new weapons to be used in later missions. Both characters can use the sword, long sword, spear and bow, but Frey can wield Thor's hammer, while Freya has access to a magic staff. Crystal Mana can also be gathered to improve the durability of your character's armor. 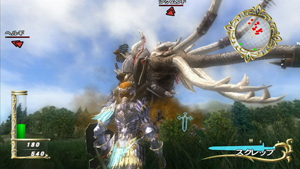 Up to four players can take part in co-operative play over the Nintendo Wi-Fi Connection.